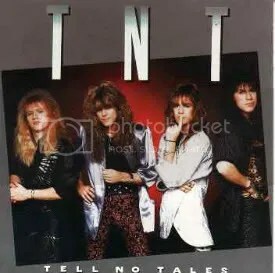 TNT was one of those bands where I always saw high praise for them, but never got around to buying their albums. My first TNT album was 2004’s My Religion, which I picked up shortly after it was released. I wasn’t impressed by it, but figured maybe I needed to hear some “classic” TNT, so I later picked up this one, which was their biggest hit in the U.S. This was the album that marked a more concentrated effort to go mainstream and uses a pop metal sound (some of it reminds me of Danger Danger) while still displaying some great guitar work. Well, I’m still not impressed all that much by TNT. There’s a few good songs here, but they are all very much of the “guilty pleasure” vibe. This is cheesy keyboard-heavy 1980s melodic hard rock. I’m not much of a fan of Harnell’s voice either. He’s just too wimpy sounding for me. “10,ooo Lovers (In One)” was a very minor success for the band in the U.S., but the real standout is the album’s closer — “Tell No Tales” which is pure screamin’ heavy metal. The album cover is absolutely awful. Even by ’80s standards. It’s just so boring. It looks like something that should be on the BACK of the album or perhaps inside the booklet or maybe the cover to some low-budget compilation disc.